In a recent presentation, Jill Dyche, VP of SAS Best Practices gave two great quotes: "Map strategy to data" and "strategy drives analytics drives data." In other words, don't wait for your data to be perfect before you invest in analytics. Don't get me wrong -- I fully understand and support proper data management and governance, especially data management for analytics. At the same time, I would urge you not to postpone your adoption and use of analytics until your data is "ready." The dirty secret is the data will never be fully perfect or fully "ready" for analytics. Data stored within a typical data warehouse will require analytical-based data transformations and/or different storage prior to the use of analytics anyway. 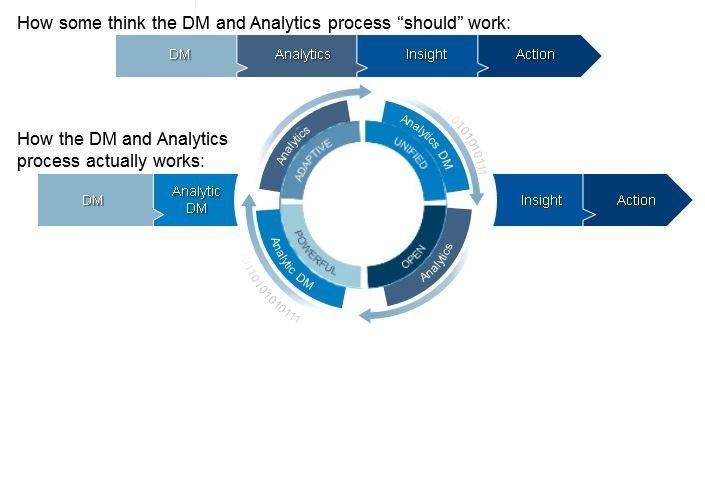 If you wait to adopt analytics, you'll do yourself and your organization a great disservice because you could be gaining competitive value out of the data you have today by using analytics now. Furthermore, one can make use of analytical data preparation and analytics to help identify data issues that can then be resolved. It's best to implement analytics in parallel with your data cleanup strategy because you'll be gaining valuable insights now, while at the same time implementing processes and a continuous feedback loop to improve your overall data reliability. That will improve the value you get from your analytics. This is a win-win for both data management and the value analytics can add to your organization. It becomes it's own never-ending cycle of improvement. If you chose to wait to use analytics until your data is "ready," you may fall too far behind your competition to survive in today's markets. If you want to learn more, check out these two books: Data Preparation for Analytics and Data Quality for Analytics by Gerhard Svolba.